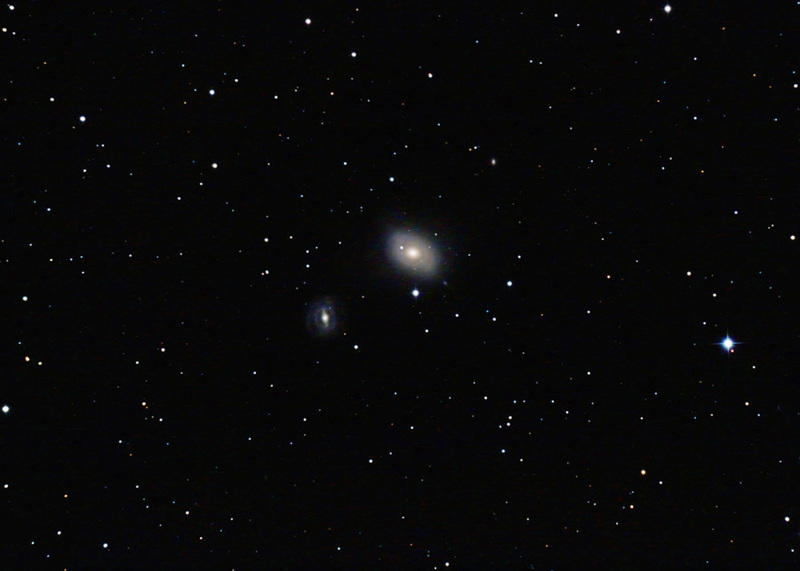 M85 is is top and center in the frame. It is classifed as a "lenticular" galaxy, in between a spiral and eliptical galaxy. It has a disk shape but lacks the distinct arms typical of spiral galaxies. This is believed to be the case because it has used up most of its interstellar matter and is no longer producing new stars. The galaxy to the lower left is NGC4394, a very distinct barred spiral galaxy. Images were focused using Live View. They were calibrated in Canon Digital Photo Professional and were aligned and combined in ImagesPlus. The composite was slightly cropped and adjusted (Levels, Curves) in Photoshop. My backyard observatory in southeastern Minnesota on 3/27/12.